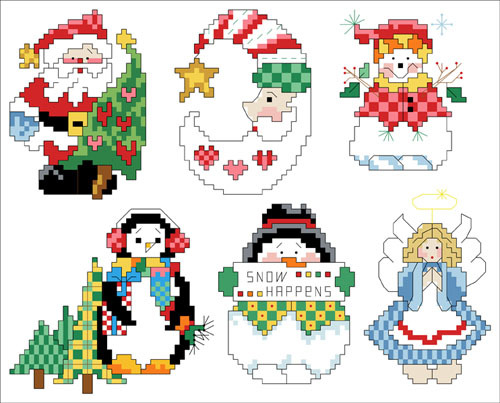 PDF Download Six whimsical Christmas ornaments are featured in this chart. From a happy Santa with heart ornaments on the tree he’s holding to a folk choir angel ready to sing a favorite song, these ornaments will be beautiful on any Christmas Tree. You may also want to stitch a motif to decorate special gift or card for a loved one. These ornaments are as merry as they can be. Contents: 6 Designs. Each design is approximately 42 stitches wide by 39 stitched high. If stitched on 14 count they would measure 3" wide by 2.75" high.